Milan 2010: Swarovski Crystal Palace present installations by designers including Tokujin Yoshioka, Yves Behar and Gwenael Nicolas in Milan this week. Yoshioka presents an LED light covered in 10,000 Swarovski crystals alongside a second globe growing inside a tank (see our earlier story about Yoshioka's Venus project). Nicolas has strung crystals through the space and captured them inside balloons, while Behar's project uses a crystal to refract light onto paper lanterns. Swarovski also present a collection of furniture in Milan - see our earlier story. Swarovski Crystal Palace 2010 launched new works by five international designers in a ground-breaking exhibition that took visitors on an experiential journey at the Salone del Mobile 2010. In 2010 Swarovski Crystal Palace presented yet another exhilarating and inspiring series of commissions, demonstrating the creative potential of Swarovski crystal and the artistic expression of each designer's work. Swarovski Crystal Palace commissioned five international designers to interpret the beauty of Swarovski crystal and incorporate their vision into a piece of design. Tokujin Yoshioka from Tokyo, French-born, Tokyo-based Gwenaël Nicolas, Belgian architect Vincent van Duysen, Dutch architectural lighting designer Rogier van der Heide and Swiss-born, San-Francisco-based designer Yves Béhar each created strikingly different concepts. "Swarovski Crystal Palace is Swarovski's think tank, a platform for creative expression and experimentation with innovation and technology," Nadja Swarovski, Vice President of International Communications at Swarovski, comments. "Our designer collaborations not only push the boundaries of the designers' own work but also of the use of Swarovski crystal in an artistic, decorative and functional way." The Swarovski Crystal Palace exhibition, an incubator for cutting edge design, demonstrated the merging of art, design, science and technology. Each designer's creative expression was captured in single room installations, captivating the imagination of each visitor. The final designs were a combination of sculptural pieces, art objects, or works which had a decidedly architectural quality. The exhibition brought on board Jules Wright, founder of the The Wapping Project in London and a background in theatre, who created a mise-en-scène that brought dramatic life to the different designers' works. The guiding theme was inspired by the idea of inspirational palaces - from Versailles with its hall of mirrors, to Japan with its Zen aesthetic, to the Winter Palace in St Petersburg. Each design was showcased in a separate room, allowing the designers the opportunity for creative expression. "Every space focused the eyes on the specific object and the environments contextualised each piece in a theatrical way," Wright explained. As visitors moved through the exhibition, they engaged in a journey through the different worlds and environments conjured by the designs. The journey culminated in a final room celebrating some of the staggeringly inventive concepts created by the world's most innovative designers for Swarovski Crystal Palace over the last 8 years. "We were delighted to have Jules Wright's involvement this year in curating the show. Her concepts have enhanced the meaning of each piece, each design," Nadja Swarovski commented. Visitors entered the exhibition through a room dedicated to Tokujin Yoshioka's design. For Swarovski Crystal Palace he created an installation, which consisted of a 1 metre diameter globe encrusted with 10,000 Swarovski crystals and lit from within by 600 LEDs. An accompanying piece featured another globe suspended in a vast tank of water, on which crystals grew naturally. The design was an evolution of Yoshioka's 2008 work entitled "VENUS - Natural crystal chair" in which the chair - like Venus - emerged from the 'water' as the crystals naturally grew on its frame. "What is important to me is not just designing another sculpture with crystal, but to create a star which shines in the viewer's heart," Yoshioka explained. His approach was to, "incorporate the element of beauty born of coincidence," into his piece, adding that, "it was technically challenging because the unpredictable element found in nature had to be accurately expressed by human design." "I wanted to imagine a space with no gravity," Gwenaël Nicolas comments on his project, which consisted of two separate designs. The first item was almost, "not an object anymore, where crystal and light become life." Nicolas created large, free-floating, transparent balloons filled with helium, in which floated a small crystal sculptures lit by a battery powered LED inside. The balloons, which measured 2.4m in diameter, drew on NASA technology to enable them to be as thin and transparent as possible. The LED light emanating through the crystal within set off a series of 'sparks' which moved as the balloons and crystals gently floated through the room. A separate design consisted of a 10m long string of crystals incorporating LED lighting that was programmed to set off more 'sparks' which jumped along the length of the rope. Vincent van Duysen created a highly versatile glowing 'beam' encrusted with Swarovski crystals. The design could be used on its own - suspended above a table for example or leant against the corner of a room, or joined together as modular elements to create dramatic architectural shapes. The elements came in three different widths - from 6cm to 16cm, and three different lengths, from 140cm to 220cm. The surface of each bar featured a 'crust' of randomly assorted, different sized crystals set into resin. Sandwiched between the crystal exteriors was a thin glass panel which gave the 'beams' their structure and rigidity while also acting as a vehicle for the LED lighting within. Van Duysen commented on the way in which Swarovski crystals brought out an element of playfulness in the design process; "They remind you of natural elements like water and ice, and allow you to bring in more poetic and emotional aspects to lighting design." He also commented on the pleasingly contradictory nature of the crystals used in this design, with the outer 'crust' having a temptingly tactile quality while actually being surprisingly rough to the touch. This installation was an interpretation of the crystals' purest, most intrisic features: how they spark our imagination. The installation relied on the beauty of the crystals and had the magic of the Northern Lights. Rogier Van der Heide comments: "I presented Swarovski Crystal Palace in Milan as a dreamy cloud of crystals, a three-dimensional sculpture that expressed the natural, magical, imaginative and beautiful." 'Dream Cloud' consisted of thousands of pure crystals floating in the air, transforming the space into a captivating sculpture that relies on the reflective properties of the crystals against the blackened walls. An external source of light illuminated the cloud of crystals with a changing spectrum of colours. A body of black tulips carpeted the floor which provided a dramatic setting. 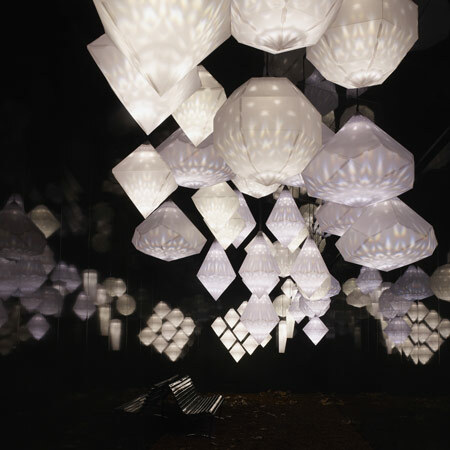 Yves Béhar combined the possibilities of technology with the inherent qualities of Swarovski crystal to create a beautiful yet surprisingly affordable lighting arrangement, which consisted of a series of deceptively simple 'paper lanterns' shaped like crystals, within which light was refracted from a real crystal, casting its patterns on the surface of the paper. Béhar's design was created with a focus on sustainability and affordability, featuring a faceted shade made from recyclable materials, one crystal and one low-energy consuming LED light. The design featured 6 different crystalline shapes in varying sizes, which could either be used individually or clustered together to create a striking effect.